“In the seen, there will be just the seen. In the heard, there will be just the heard. In the sensed2, there will be just the sensed. In the cognized, there will be just the cognized. This, Bāhiya, is how you are to train yourself. Then, Bāhiya, there will be no ‘you’ in terms of this. There is no ‘you’ here, or beyond, or in between. Then while the Blessed One was teaching this brief Dhamma teaching to Bāhiya, Bāhiya’s mind was liberated from the corruptions by means of non-attachment. After the Blessed One had instructed Bāhiya with this brief instruction, he left. And not long after the Blessed One left, a young cow encountered Bāhiya and killed him. 1 Nāga. 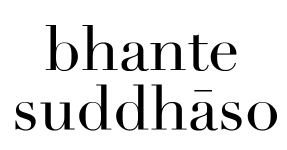 The literal meaning of this is “elephant” or “dragon.” It is sometimes used to refer to any exceptionally majestic, dignified, and lordly being – such as Arahants. 2 Muta. This includes the senses of smell, taste, and touch. 3 Thūpa (Skt. stūpa). A monument commonly erected over the remains of a deceased saint.